Mutton can sometimes conjure up images of an old, wind-beaten hag limping about the hill. I’m here to assure you all that this simply isn’t true. If we give the meat from a sheep its proper address, lamb becomes hogget first and then mutton. Mutton can be little over a year old, but if you want a wonderful and rich flavour then you shouldn’t discount mutton even when it reaches three or four years old. My tip here is to always let your main ingredient sing the loudest in a dish. I firmly believe that it would be a sin to diminish all of our farmers’ passion and hard work under a blanket of overworked flavours. 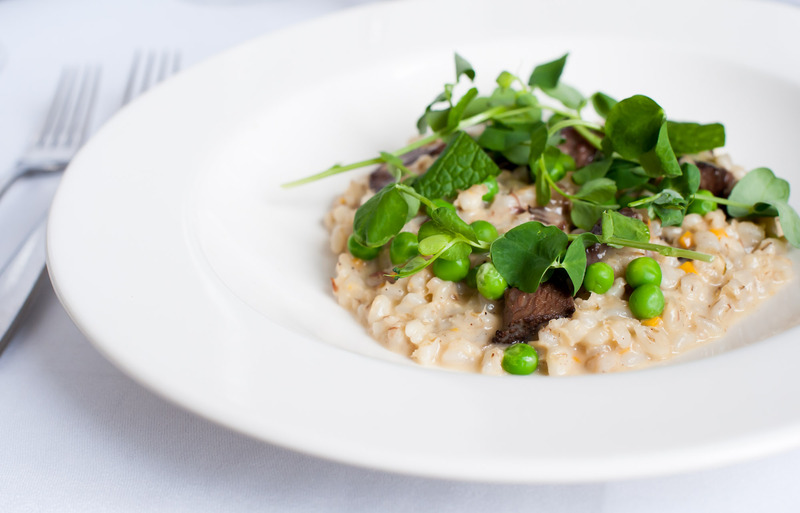 This dish respects everything; barley and mutton have been mates since Rob Roy was in nursery and the dish is simply lifted with a zing from the fresh peas and mint. Source your mutton well, for the restaurant I trust no other man than farmer Jim Fairlie of Logiealmond, but you’ll find a good choice of mutton available at your local butcher and farmers’ markets. My only demand would be that wherever you buy your mutton, aim for Scottish. As a little aside, I know this isn’t the season for fresh peas and true to my promise for this blog, I’m going to lash all the cooking snobs and say go for good frozen peas to tick the box here. Season the mutton well and place in a preheated oven at 140 c, cover with foil and cook very slowly for approx 3 hours till the meat leaves the bone easily. Allow to cool and, with a fork, gently shred the meat and toss in any cooking liquid that remains. In a solid, wide-based pan melt the butter, add the shallot, carrot, celery and garlic and a small pinch of salt. After a couple of minutes, add the barley and cook gently for 2 minutes, deglaze the pan with wine and reduce fully. Add a pint of water or chicken stock, a pinch of salt, grind of pepper and cook until the barley is softened (with just a little bite) which should take approximately 20 minutes. It may need a little more stock during cooking. Once all of the liquid has evaporated and the barley is rich and softened add the shredded mutton. Gently return to a simmer, stirring all the time, then add the remaining eight ingredients. Mix well and warm through, adjust the seasoning to your liking and serve immediately with some pea shoots or green vegetables.